We like white linens. Well, I like white linens – I don’t think Evan pays any mind to what color sheets he’s sleeping on. But since I like white, it tends to fill our linen closet. 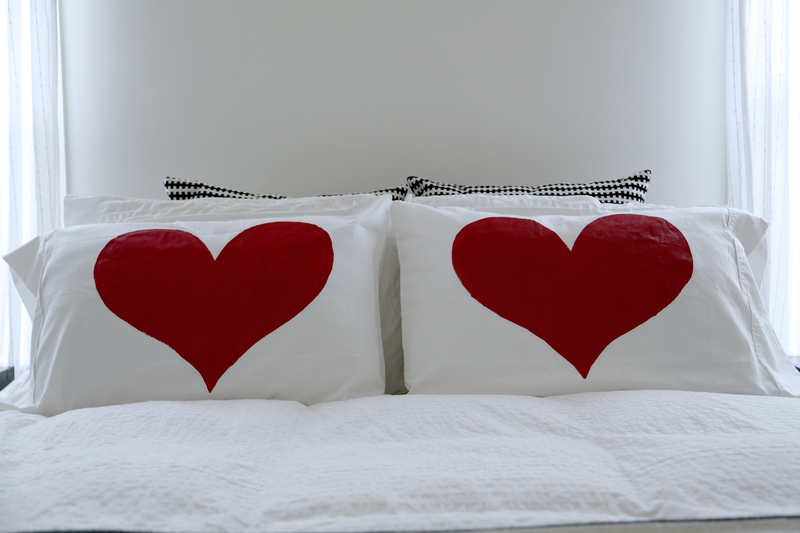 I was feeling crafty earlier this week and since white fabric makes such a perfect canvas, I decided to show a little “love” to a couple of our pillow cases. Want to make some too? 1. MAKE A STENCIL! Make sure your card stock is large enough to create a stencil that will fit your pillow cases. Fold your card stock in half and draw half of a heart at your desired size. Cut the shape out and unfold your heart (just like you did in grade school!). You may need to balance it out a bit to get the perfect heart shape. This step can also be achieved freehand, if you dare! 2. 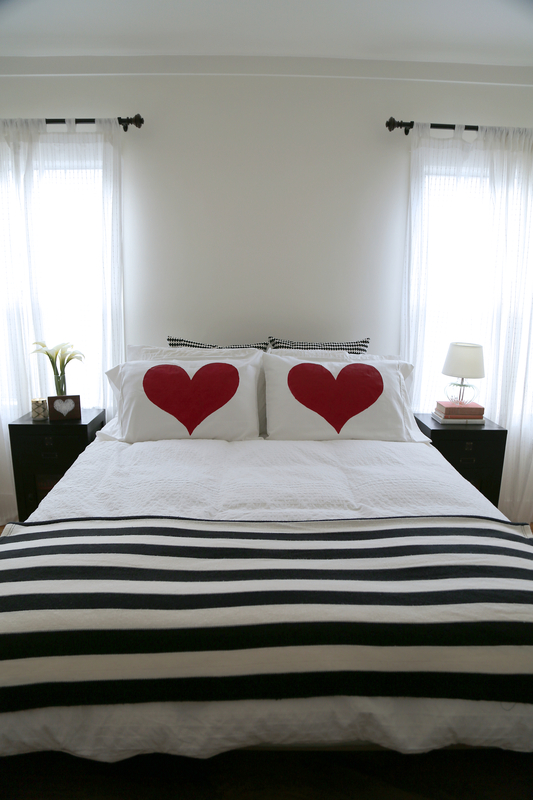 Outline your stencil with a pencil directly onto your pillow cases. 3. If you’re using fabric paint, paint away! Fill your heart in completely. Follow drying and washing instructions for your specific paint. 6. Once your paint is dry, wash your pillow cases alone. The paint should not run or anything, but just in case, I wouldn’t want you to sacrifice any of your important garments on this first wash. After the first wash, you’re new pillow cases should be just fine washed with other articles but do not bleach. Such an awesome idea for valentines! Incredibly cute, clever, and crafty! Love this!! So cute I had a pillowcase similar as a kid and have always wanted to find another and haven’t seen it yet. Thanks for the tip. Anne, that’s so awesome! I hope these live up to your childhood memories!